There’s an old saying that the way to a man’s heart is through his stomach. That may be all well and good, but I say that fair is fair and this credo should be extended to all world travelers regardless of gender… especially when they’re traveling in Sri Lanka! 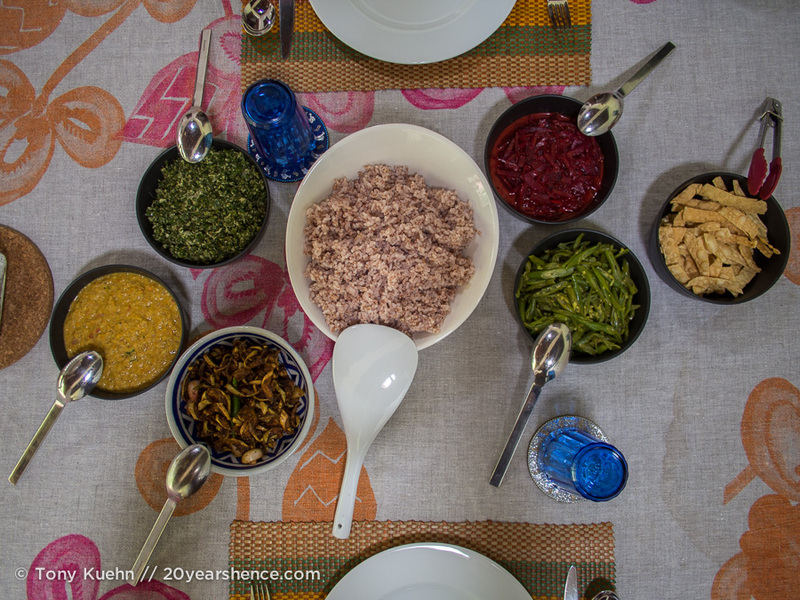 Sri Lanka is a country whose national cuisine I knew embarrassingly little about prior to our arrival; overshadowed by its neighbor to the north, I assumed Sri Lankan food would be some subtle variation on Indian food with a similar flavor profile. 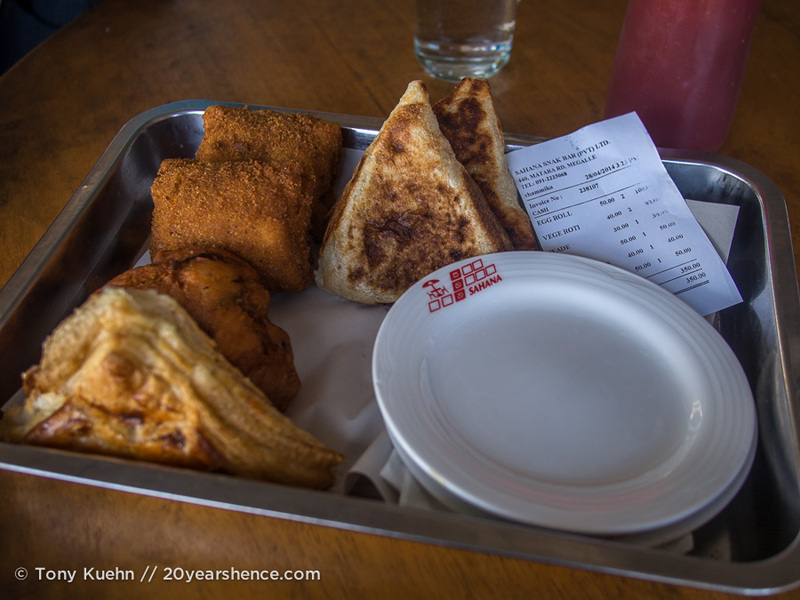 Given that Indian food is one of my all-time favorites, I had absolutely no problem with this, and looked forward to eating my weight in creamy curries and samosas during our three weeks in the country. 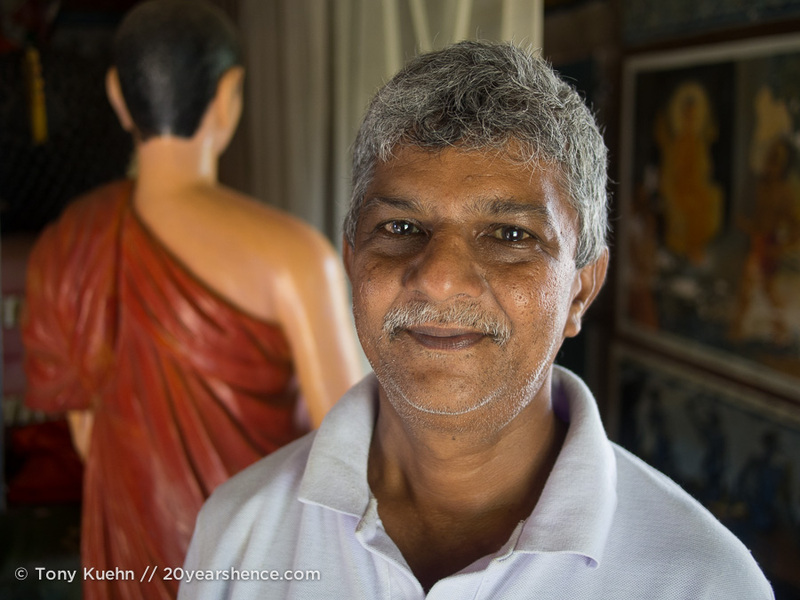 So you can imagine how intrigued I was when Brent Carey, owner of Templeberg Villa reached out to me boasting about Templeberg’s resident chef, Trixie, who he claimed whipped up some of the finest South Asian cuisine on the island. 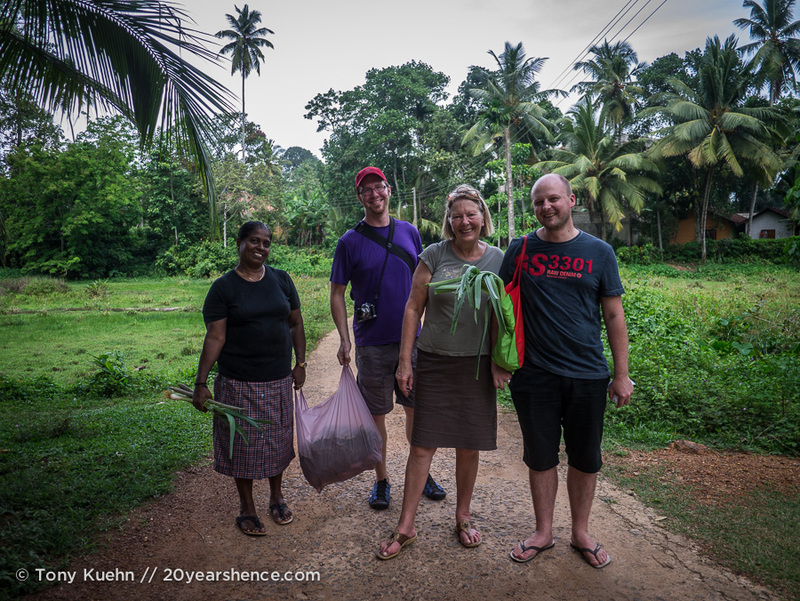 Intrigue transformed into excitement when Brent asked whether we might like to come and stay at Templeberg for a few days when we were in Galle so we could join Trixie in the kitchen and get a hands-on cooking class where we would learn to prepare some Sri Lankan staples. 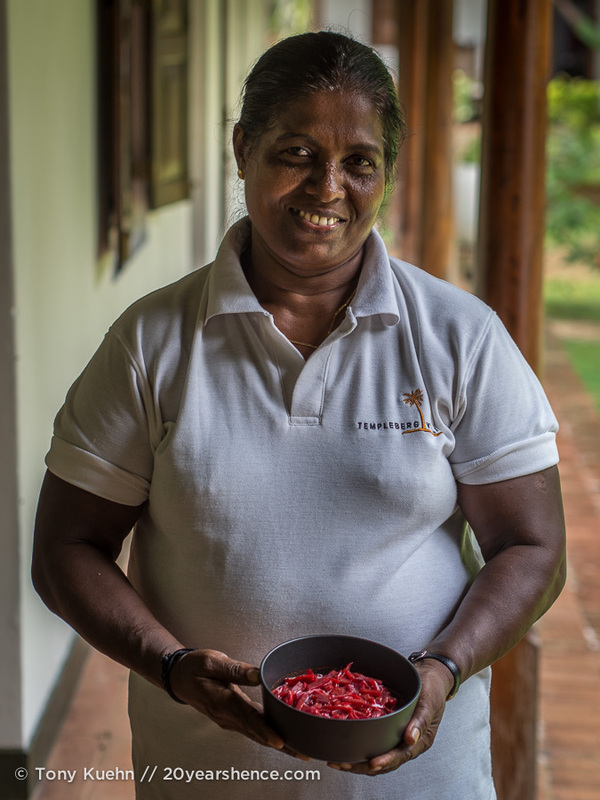 A cooking class with Trixie would be incentive enough to visit, but when I learned that Templeberg Villa was a small boutique hotel housed in a restored Dutch Colonial merchant house dating back to 1864 that sits in the heart of the Sri Lankan jungle, the decision quickly became a no-brainer! 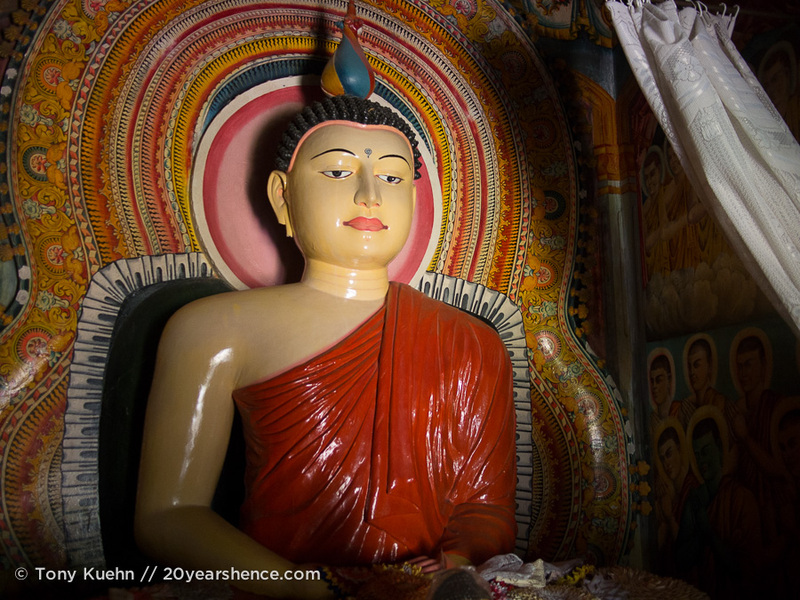 There aren’t many downsides to driving around Sri Lanka in your own tuk tuk, but one of them is that we got lost A LOT. 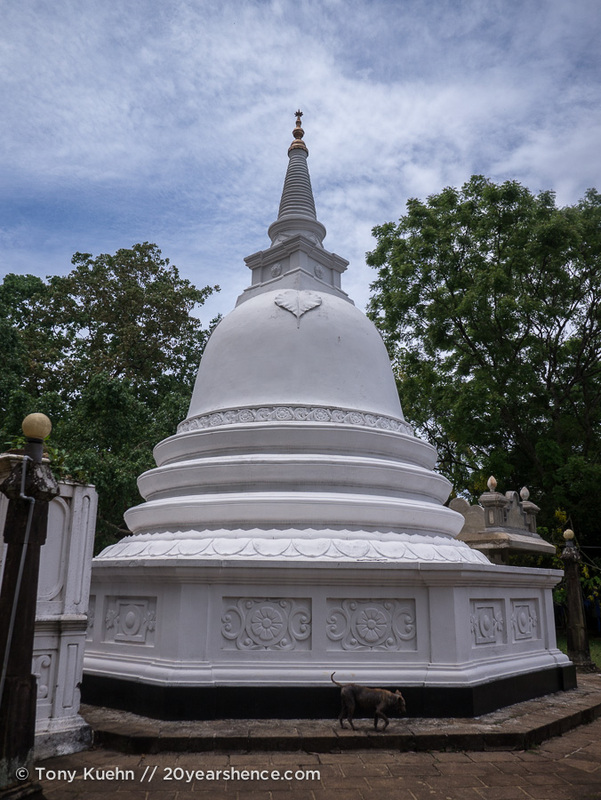 Thankfully Sri Lankans are incredibly friendly and helpful and did their best to make sure we made it wherever we were going, but we still managed to miss the turn off for Templeberg four times. By the time we finally made it up the winding driveway, we were more than ready for the paradise that awaited us. And paradise it was! Although daylight was fading (a consequence of us driving back and forth on the main road looking for our exit for nearly an hour), stepping out of King Tuk felt like tumbling into a forest utopia. 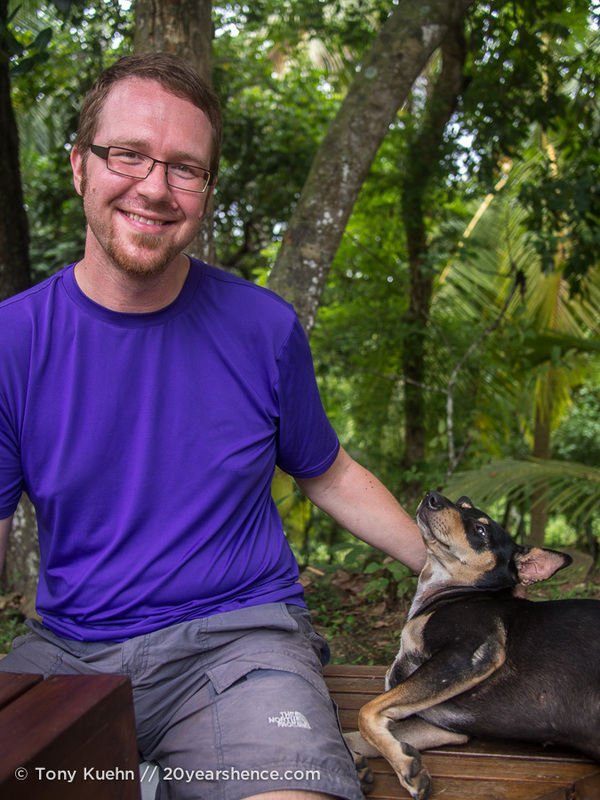 As sounds from the jungle—just 150 meters from the edge of the property—chirped a wild symphony heralding our arrival, Brent and his partner Chris ushered us to our room, Templeberg’s two resident guard dogs (the oh-so-adorable Mumu & Rewa) hot on our heels. Of the six rooms that currently make up the property, we were placed in the Blue Room (the name quite obvious when the décor is taken into account), which features a cozy Queen-size bed and a private en suite bath, complete with a gorgeous walk-in shower and all the fancy toiletries we had been deprived of during our long-term travels. 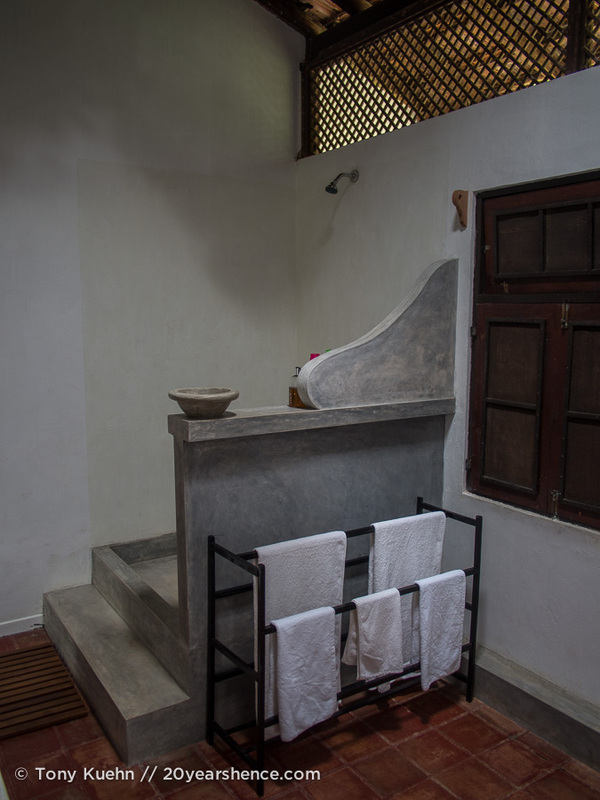 This, paired with the fantastic water pressure courtesy of the rainfall shower head, meant that for the duration of our stay we flitted about in a particularly sweet-scented heaven. One of the villa’s lounge areas—perfect for curling up with a book! 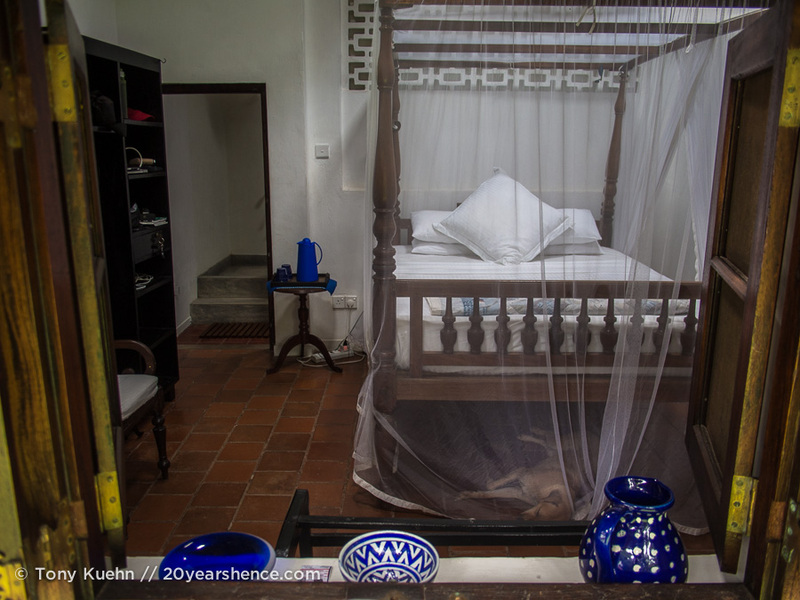 We absolutely adored our room, but for those looking for even more indulgence, the villa also has a luxury room, the Plantation Suite, which features a King bed, walk-in-closet, and even a writing desk for channeling your inner Ondaatje or even Arthur C. Clarke. 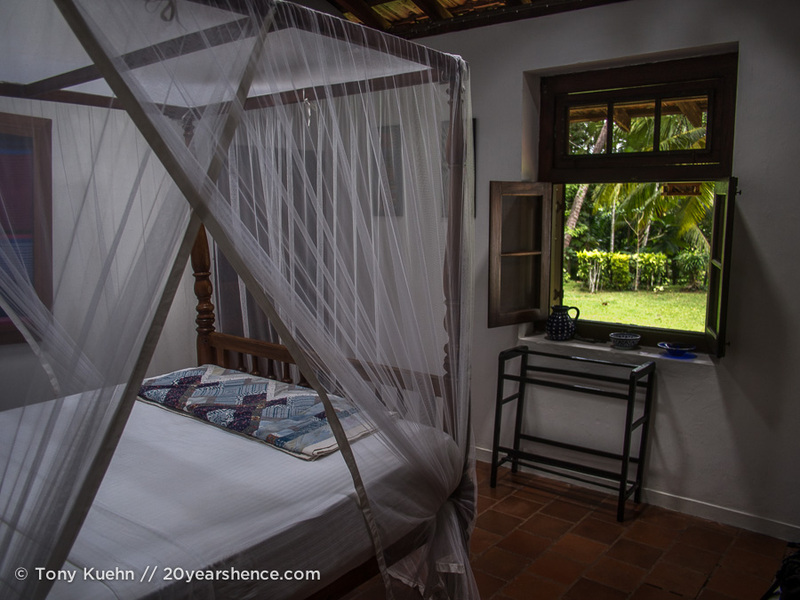 For families or those looking for a little extra privacy, the villa also boasts a two-bedroom bungalow with a private veranda (complete with hammock! )—while we were there, an Australian couple traveling with their teenaged son were staying there and they absolutely loved it! So jealous of their hammock! Templeberg Villa is located about a five-minute drive from downtown Galle, and an additional 10-minute drive from the historic fort area, so although having your own transportation is not required (and the staff there will only be too happy to arrange a driver for you), it is certainly handy. 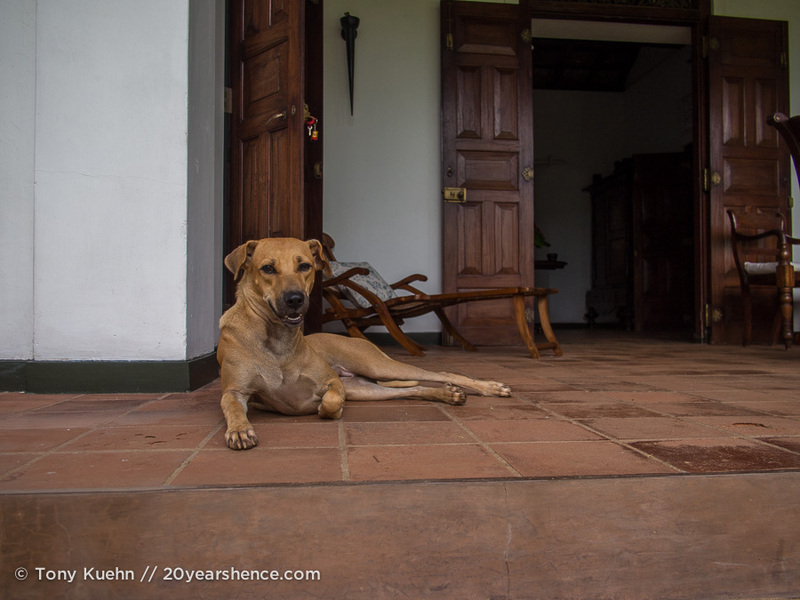 To be perfectly honest, for the bulk of our stay at Templeberg, we were so enchanted with the place that were generally pretty content to just laze about around the grounds. 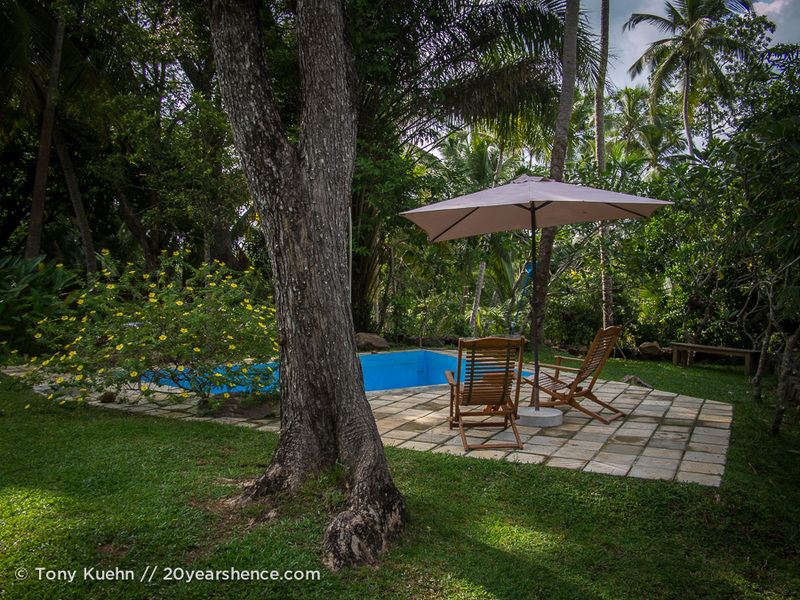 It’s the perfect place to unwind with a drink and a good book, letting the sounds of the shy monkeys leaping from tree to tree and exotic bird calls lull you into a state of utter relaxation. 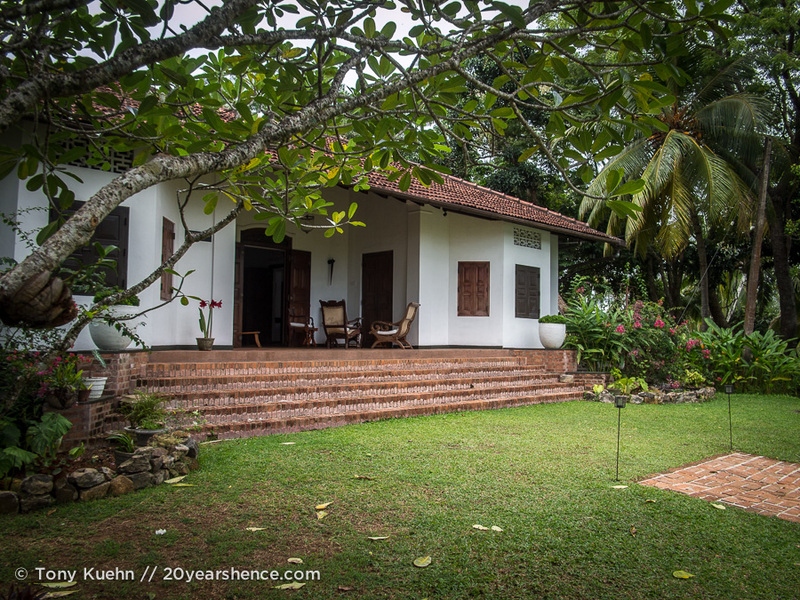 Given the humidity present in the Galle area at this time of year and just how pretty the Templeberg grounds are, it’s really one of the smartest things you can do. 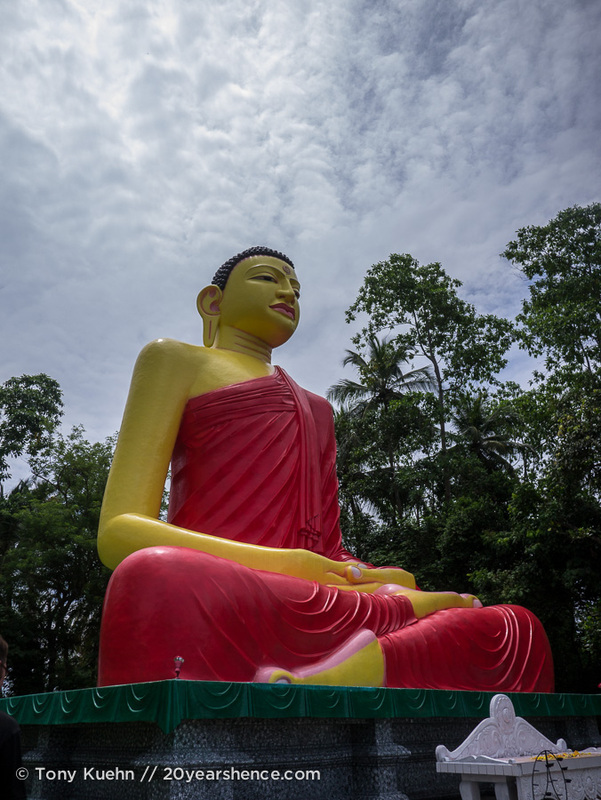 But during occasional bouts of energy, we did found the surrounding area really lovely to stroll (albeit dripping with sweat), and even made our way up to the neighborhood temple on one occasion where locals were primping the grounds and getting ready for the upcoming Vesak festivities celebrating Buddha’s birthday. 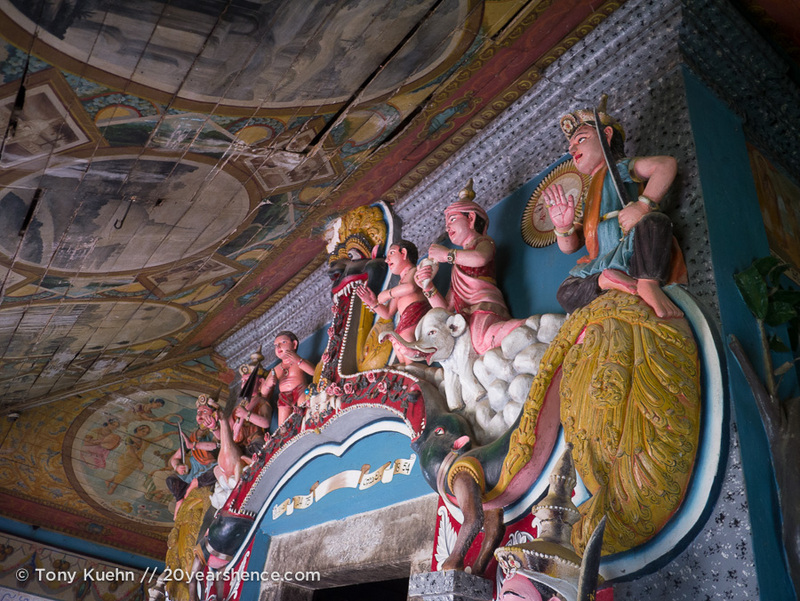 During our time there, one of Templeberg’s staff let us into the sacred shrine area so we could gawk at the opulent carvings, were allowed to ring one of the temple’s massive holy bells, witnessed a “touched” girl speaking in tongues, got a crash course in fundamental Sinhala phrases, and were antagonized by the head monk’s rather wary dogs… definitely not your average guidebook experience, but we loved that the Templeberg staff had the interest to help us go beneath the surface and see a slice of unabashed local life. One of the reasons we tend to limit our stays at foreign-run upscale places is because I am always worried about getting an inauthentic, whitewashed experience, one that could be had anywhere in the world and where your interactions with the local populace is limited. No need to worry about this at Templeberg—the staff were courteous and professional, but they were also genuinely kind and we often felt during our three days there that we were all part of one big family. I want to emphasize, because I think it’s so important, the good work that Templeberg Villa does, not just for its guests (though we were certainly pampered beyond belief while there) but for the local community as well. Running the property is a huge passion project for Brent and Chris, both of whom actually hold other full-time jobs back in Australia, but I think it is this passion—for Sri Lanka and the hospitality industry—that fuels them to go the extra mile and get involved with projects near and dear to the hearts of locals, whether it’s donating paint supplies to help give the nearby temple a facelift or assisting a turtle sanctuary get the word out about conservation efforts. Additionally, as supporters of the arts, every year Templeberg offers a residential writing fellowship where they host (flights, room & board, and even a daily stipend are included!) an author for up to a month so they can give their all to a promising literary project. 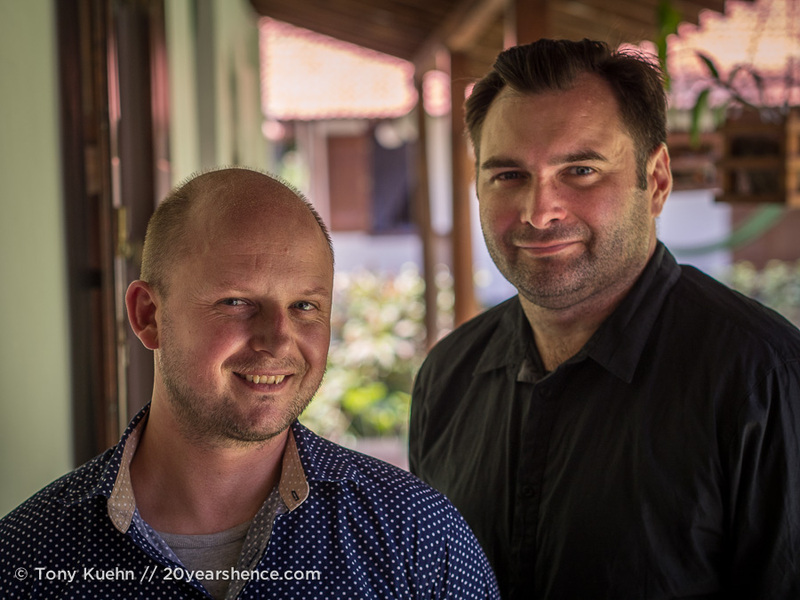 It was really inspiring and heartening to see how Brent & Chris were using their power for good, giving back and enriching Galle. All of these aspects of Templeberg made for an incredible stay, but let’s get to the backbone of any great stay: the food! Brent made big food promises when luring us his way, and I have to say we were not disappointed. Not just the meal we made with Trixie, but every feast we enjoyed at the villa was a veritable foodgasm. (And yes, every meal we sat down to wound up taking on feast-like proportions.) 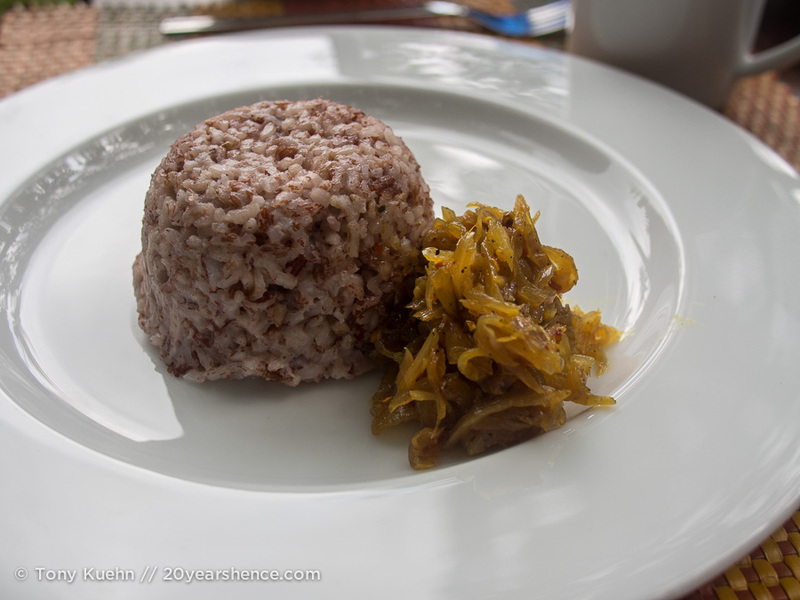 Starting our days off right, we’d tuck into heaping bowls of fresh curd accompanied by generous lashings of palm treacle, local fruits and cereal, and then a local offering—red rice with an aromatic onion chutney or thin little rice crepes known as hoppers served with a fried egg in the middle and with a dollop of spicy mango chutney. With breakfasts like that, it was a testament to how good Trixie’s cooking was that we would make room for other meals throughout the day. Although we did dine out a few times (most notably at an awesome seafood place in neighboring Unawatuna at Lucky Tuna where we put together the most decadent seafood platter of all time; and also once at one of Galle’s most famous “short eats” restaurants where we tucked into fried nibblies for an incredibly cheap lunch), the food that Trixie dished up was definitely our favorite. Seafood platter with cellphone included for scale. 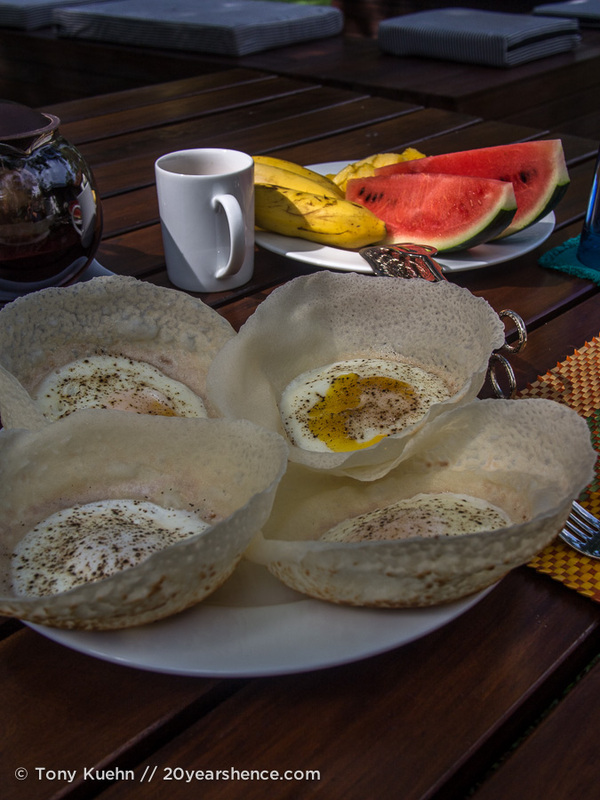 Some of the best short eats in Sri Lanka? And no meal did we love more than the one where we got to lend a hand in the kitchen. 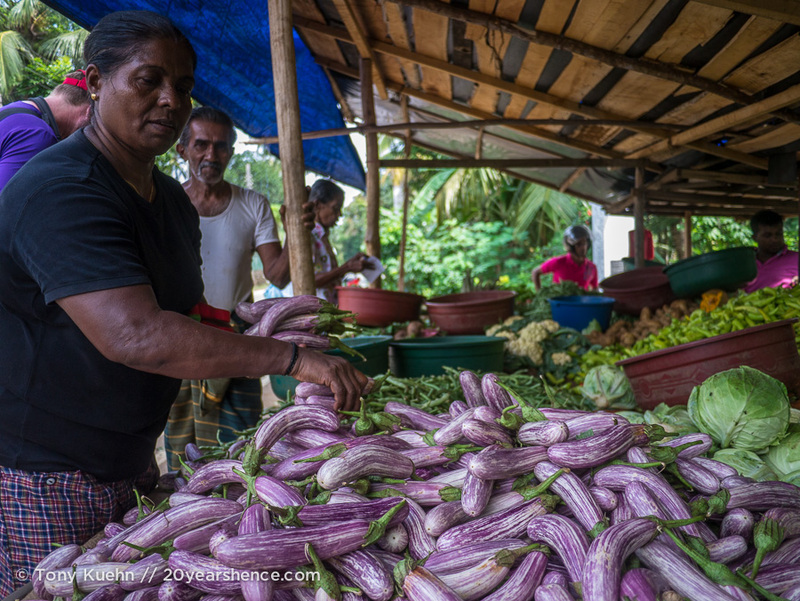 It all started with a stroll down to the local market where we got to select our main ingredients; although Galle is home to an impressive fish market, with such a fantastic array of beautiful fresh veggies, we decided to go all out vegetarian and stick to what we could purchase just a five-minute walk from our kitchen. 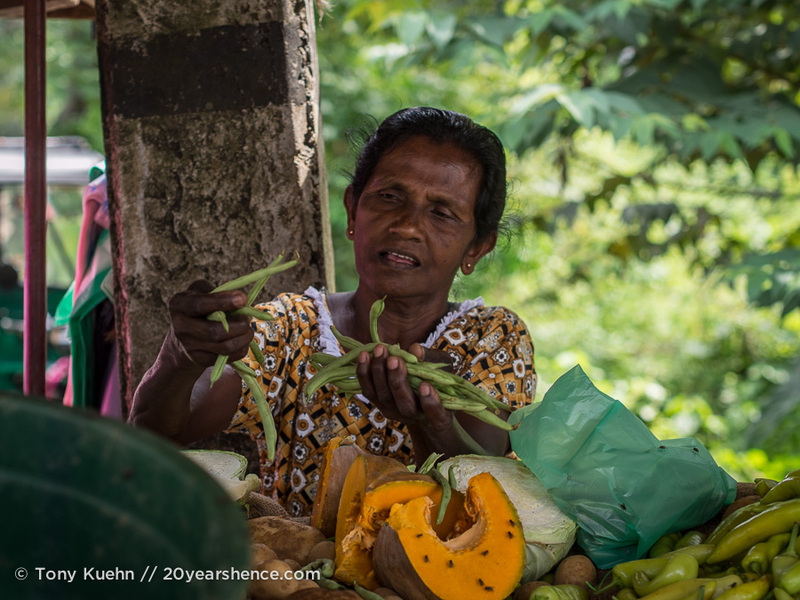 Brent told us to just go crazy and pick whatever we liked and Trixie would help us create dishes around them; with that as our guideline, we piled our basket high with both familiar (potatoes, cauliflower, okra) and unusual (mukunuwenna) veggies. All of this cost less than $10US! Then it was back to the kitchen where Trixie put us to work chopping and preparing the vegetables under her watchful eye. What I loved about her cooking style, is that like most great home cooks I know, she cooked via touch, taste and smell (or, if you like, with her heart) rather than carefully measuring out each ingredient. This is how I naturally cook, and I tend to think the best meals come from following your intuition rather than a recipe line for line. 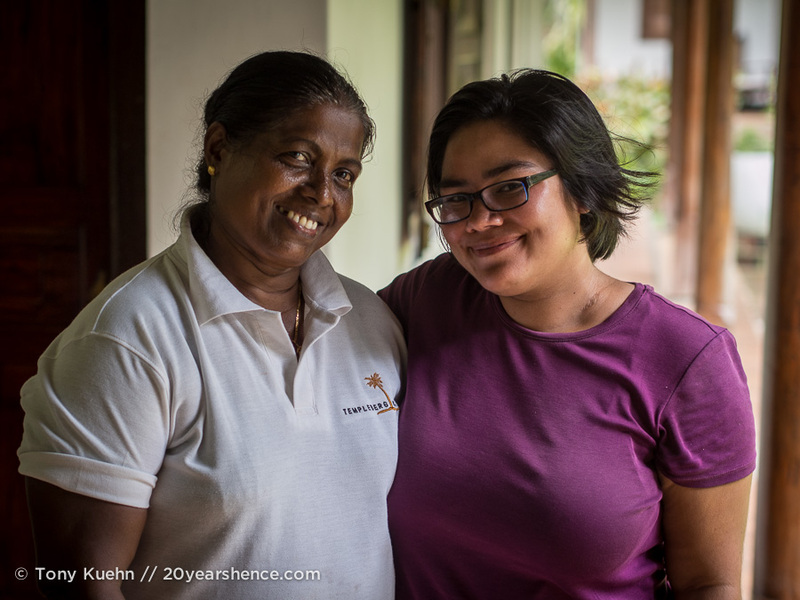 As we cooked, we learned a bit about Trixie’s past: she hadn’t always worked as a cook, but had worked for a bit with the Red Cross and even as a maid before coming to Templeberg. But, by all accounts, she was a terrible maid, and when asked what she really loved to do, she said “cook.” And now that she’s in the kitchen, making her family recipes and dishes that have been passed down from one generation to the next, she’s never been happier. It’s the kind of story that you can’t help feel good about—someone discovers her passion and then blossoms. I’ve no doubt that part of why Trixie’s food tastes so good is because of how much love and care she puts into every dish. 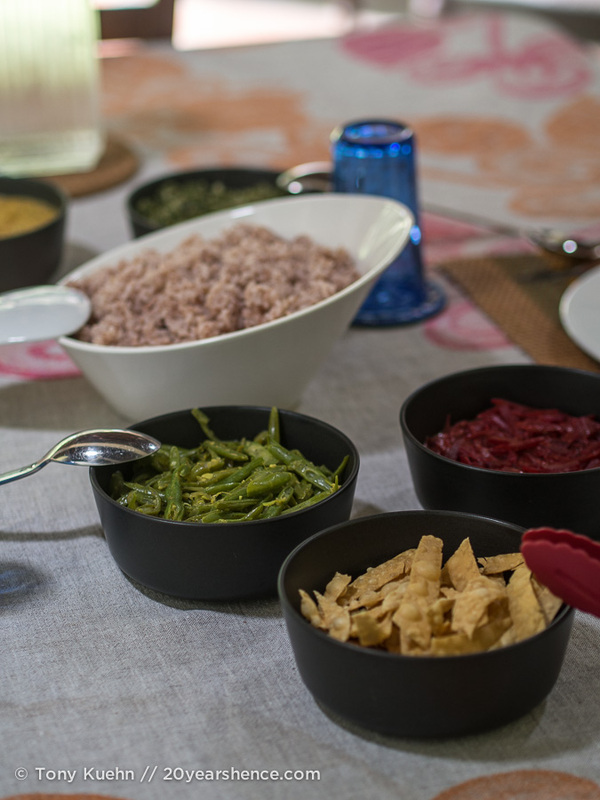 Together we created an absolutely epic vegetarian meal consisting of SIX dishes (for two people!). 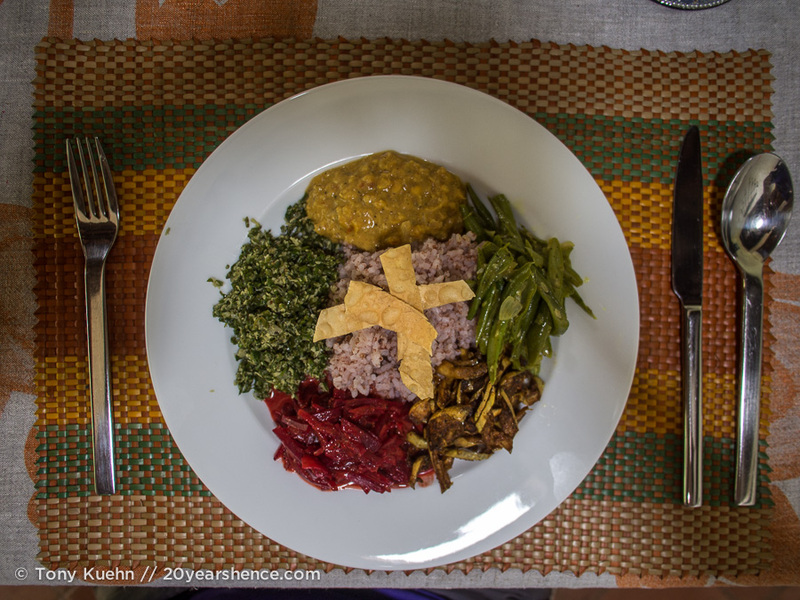 Thank goodness cooking works up an appetite and Sri Lankan food is one that only gets better the longer you cook it, because a couple hours later, we were sitting down to: beetroot curry, bean curry, brinjal moju (a tangy, crispy eggplant dish), dahl, mukunuwenna mallum (a fresh chopped salad made with a local plant and coconut and tastes a bit like tabouleh), red rice, and papadum. It was all as incredible as it looks and a really educational experience. 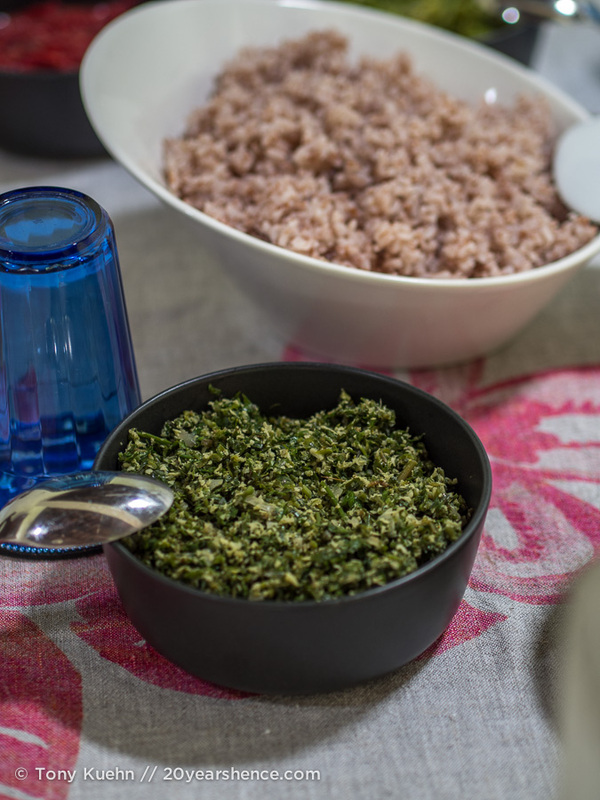 Not only did we get to learn a few unexpected/unusual ingredients that seem to be the staples of Sri Lankan cooking (mustard cream, anyone? ), but by watching each dish come together, we gained a deeper appreciation for this wonderful country’s food and distinct flavors. Most of the dishes we created are ones we had never seen before, and this meal really dispelled any myths we may have held about the interchangeable nature of Sri Lankan food with Indian food; even dishes that are found in both countries (such as dahl) tasted completely different—normally dahl is a dish I have no time for as I find it watery and pretty insipid, but Sri Lankan dahl was a revelation: creamy and rich, it is packed with flavor (likely due to coconut milk! ), and an absolute delight to eat. I had seconds (and then thirds) of everything we made, and we still had way too much food to eat in a single meal. 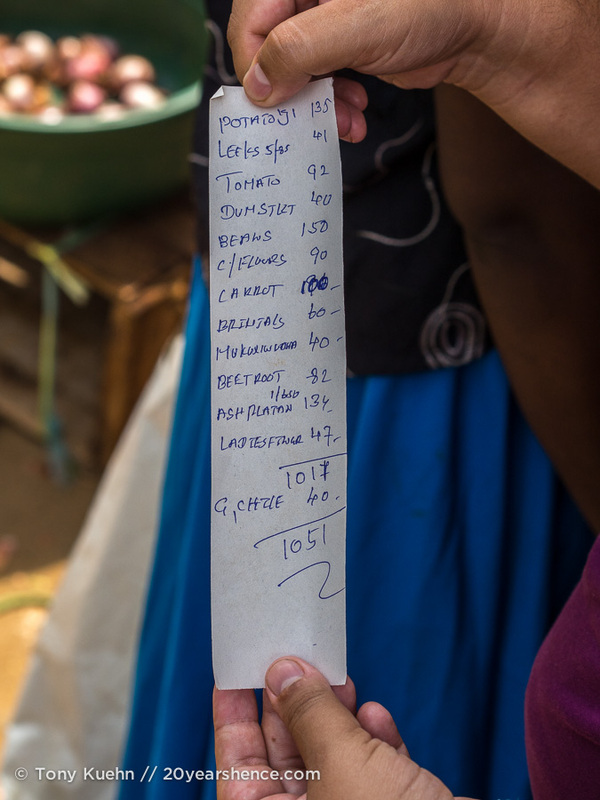 To be perfectly honest, for less than $10US, the ingredients we purchased were enough for at least 3 meals and were better than what you’d get at a restaurant. Given that Templeberg Villa offers the option to take cooking classes with Trixie where the only cost to you is the cost of groceries, this is an INCREDIBLE deal. 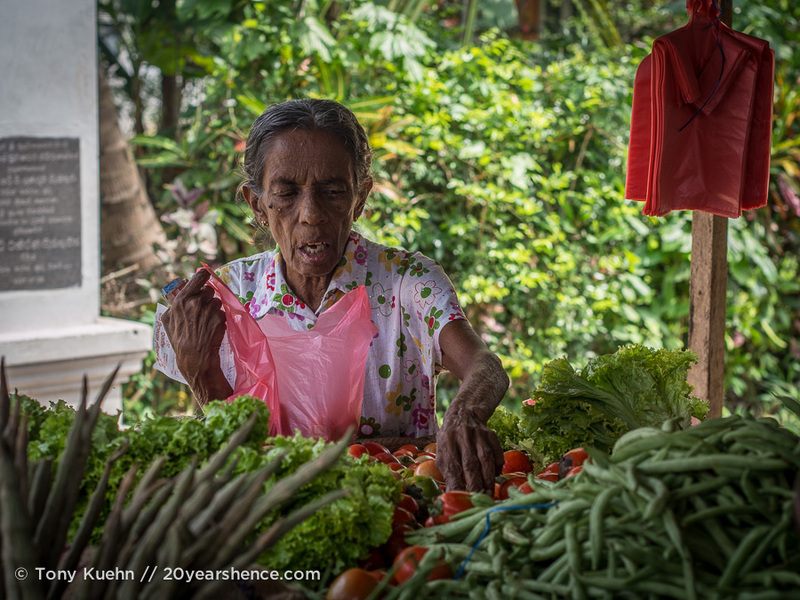 Even if you have no desire to set foot in the kitchen, you can still purchase groceries and have the staff cook lunch and dinner for you, or even give them a daily budget and they will do the shopping for you as well! It’s a nice change from going out to eat at restaurants all the time, is good for you, and meals don’t get any more local than this. 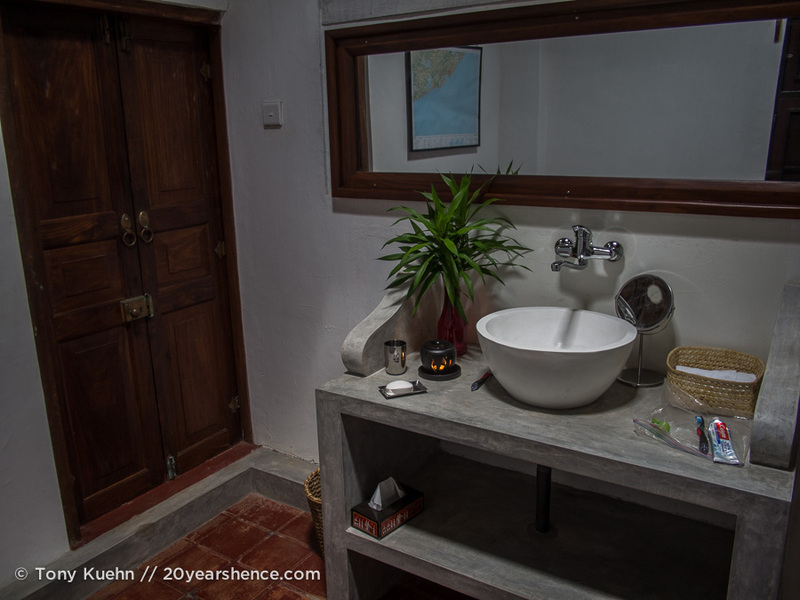 Templeberg Villa isn’t in the heart of Galle and isn’t necessarily the prototypical way that most visitors experience the city, but I personally can’t think of a better place to have based ourselves during our time there. 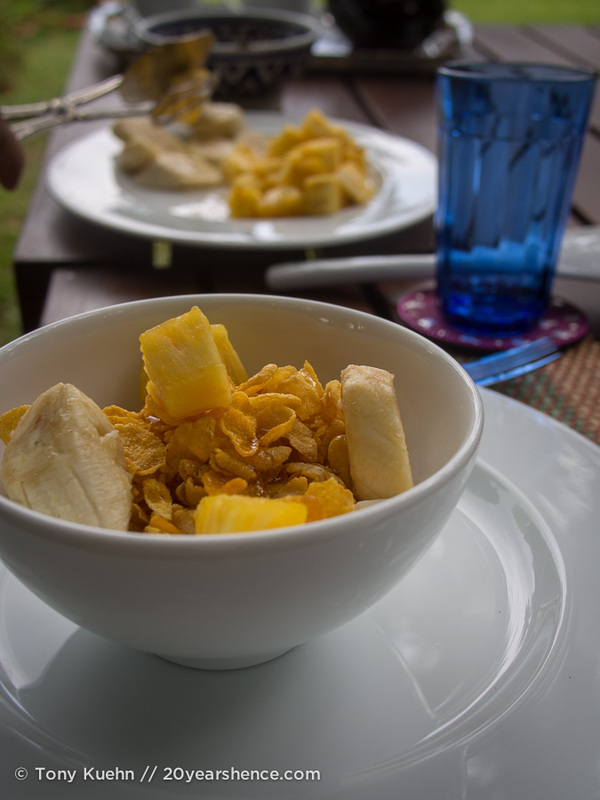 I love that not only did we get to completely relax and enjoy a little luxury, but we got to interact with Galle, its people, its attractions, and its food in a way we absolutely wouldn’t have been able to on our own. 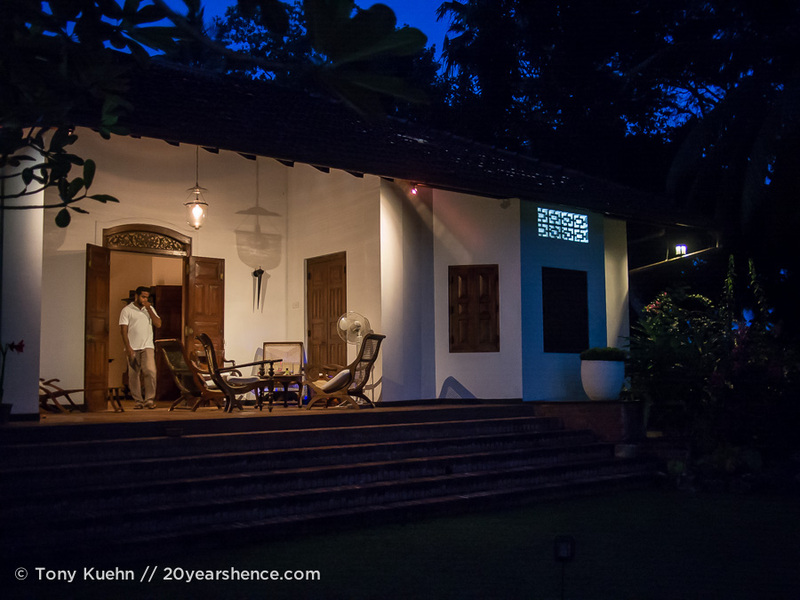 If you’re heading to Galle and looking for your own taste of the sublime, consider it found. 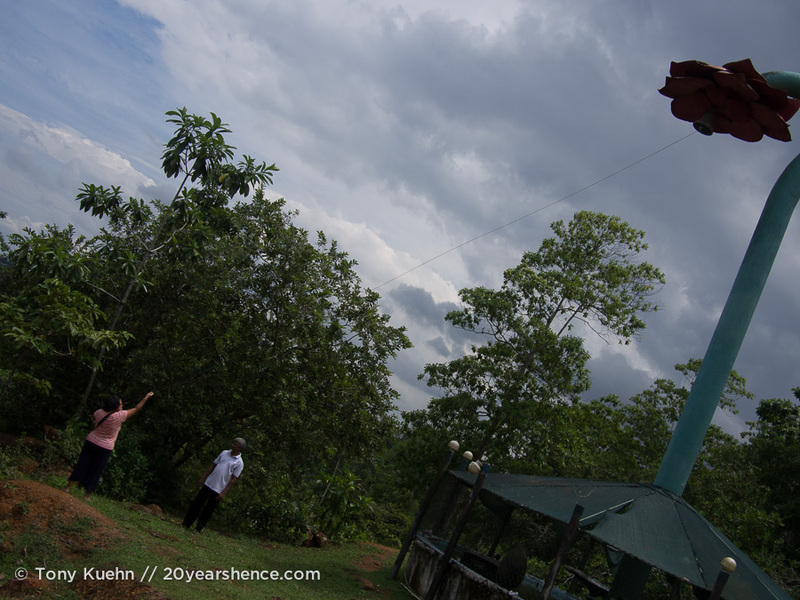 Note: We were guests of Templeberg Villa and enjoyed a complimentary three-night stay in exchange for coverage here. However, all amenities and perks we experienced during that time were freely available to all guests and we received no special treatment (apart from being allowed to peak into some of the fancier rooms for photographs); they really are equal-opportunity awesome. We are immensely grateful to Brent and his team at Templeberg for hosting us, and although our stay was provided to us free of charge, all opinions I have expressed here are my own and I have tried to be as objective as possible. The folks here really are doing a great job and offering up some cool services—we spoke to other guests who were staying here at the time, and everyone seemed as charmed with the place as we were. Note 2: If you need help selecting lodging or are curious about the other places we have stayed in the cities we have visited, please check out our Lodgings by Country page in which we list, succinctly review & rate, and provide prices of every place we have stayed on this trip. wow those photos are outstanding! I really love them! Food looks great. Gotta get myself to Sri Lanka! Yes, given that you spend so much time hanging out in southern India, you really need to pop over to SL and give it a go as well! It’s so beautiful and the food really is incredible! What a lovely experience! I love the shot of your room with the pooch under your bed. And the food – oh my. I want to learn to cook the way Trixie does! And the food. There are no words. I want it all again RIGHT NOW. I’ll have to find a South Asian market here in Toronto and see if I can make some of these dishes again! I really think you guys would love Sri Lanka so so much. 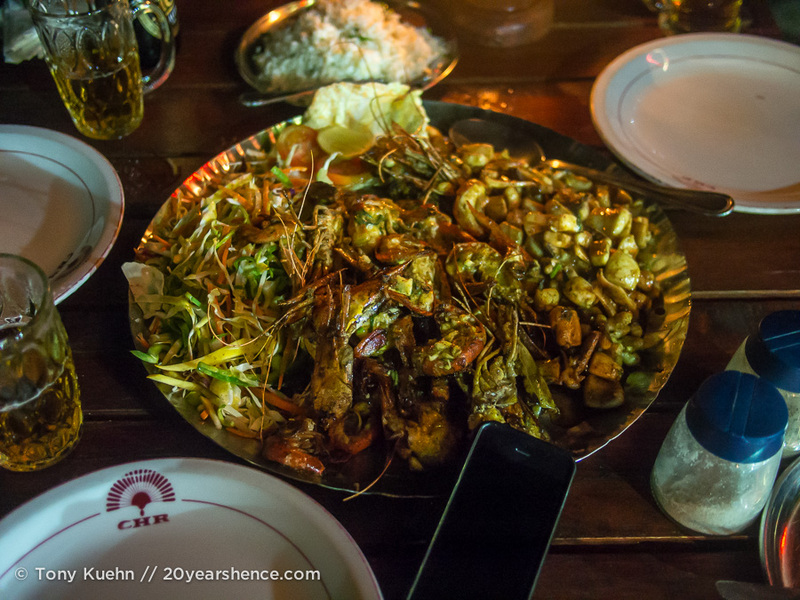 The food really is incredible, but different enough from Indian food that every meal is an adventure. And for vegetarians like you, you will eat very well indeed! Great post, certainly highlighting some of the benefits of staying at a boutique resort instead of a posh chain, no matter how nice. But it’s great when the amenities of the two collide. I know zero about Sri Lanka and even less (yes, I know that is mathmatically impossible) about its cuisine… You’ve moved me one percent. Now another 99 to go! I think chains have their place in the travel spectrum, but if we’re going to splurge, I think the attention to detail and personal touches that boutique lodging provides makes it worth the extra money. 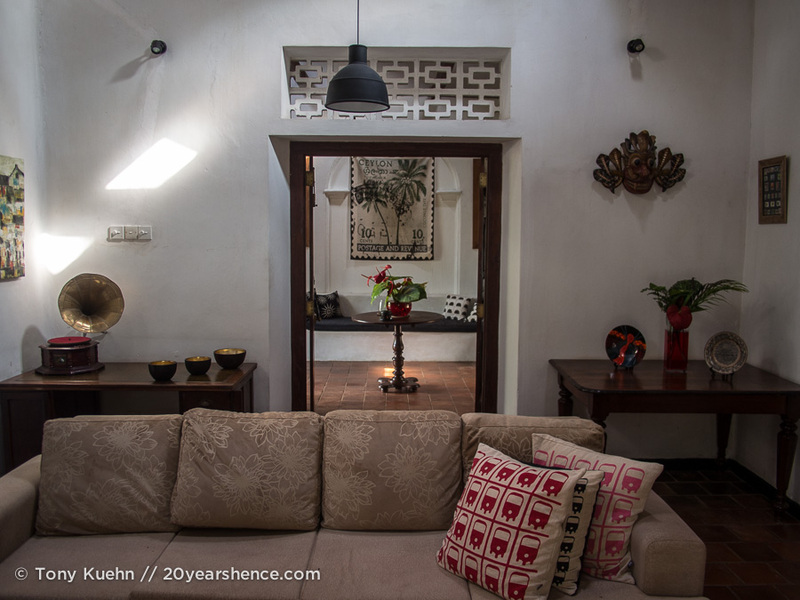 In many ways, this felt like a very fancy homestay, which is something I doubt we have ever said about our stays at larger hotels. 99 percent to go? Challenge accepted! 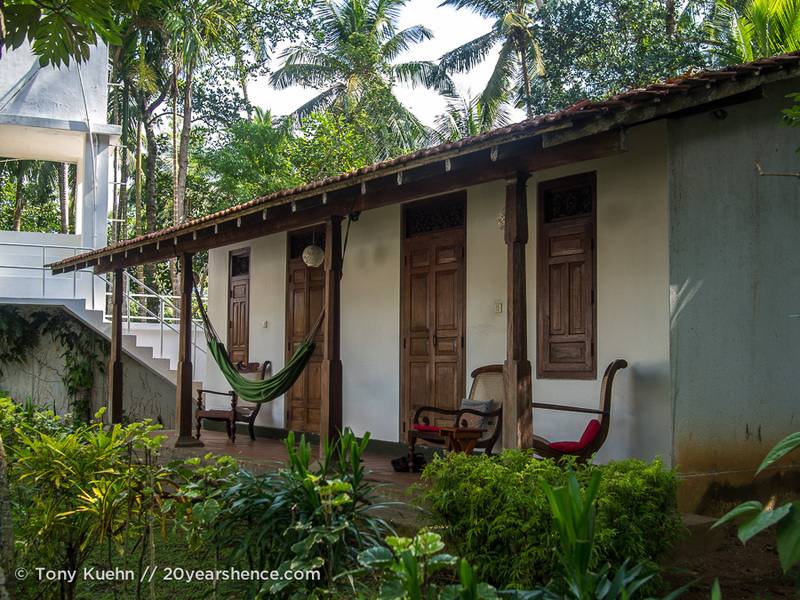 That villa with the hammock sounds like just the ticket and if I ever find myself in Sri Lanka, I’ll be looking it up! Victoria recently posted..Glitzy burlesque, and utter SHEER MADNESS! It’s so funny to me that people might consider SL the poor man’s India, because by my reckoning, it’s actually cheaper to travel to India than SL! 😉 And costs aside, SL is really a beautiful place in its own right, well worth a visit from any traveler who makes it to this part of the world. 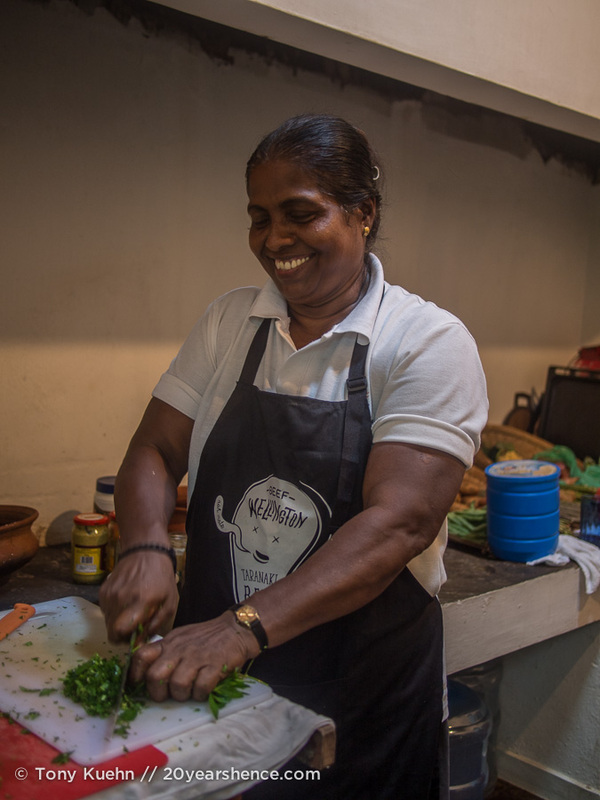 The natural beauty, the people, the food… all of it is SO good that as incredible as India is, it’s hard to think of how it could best SL on any of these fronts. 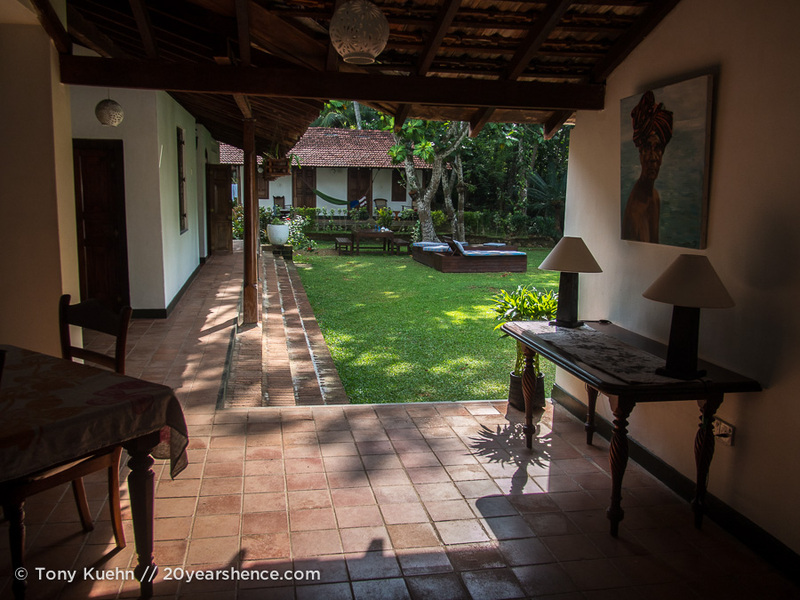 I know that private bungalow at the back of the property was a godsend for the Aussie family traveling around SL. I believe Templeberg is looking to expand and build some more bungalows on the property as well that would be perfect for private couples or families as well. If you do make it to SL, definitely check this place out! What a wonderful place! Can you tell us a little more about the turtles you visited? Also, it looks like the meal you made with Trixie was completely vegan! Would I be right in assuming that? (My eyes notice these things automatically nowadays, lol). 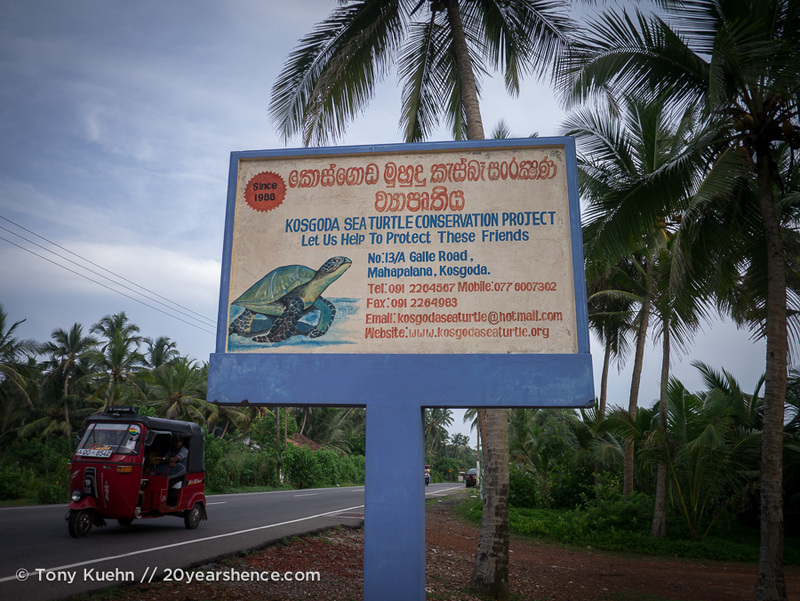 There are tons of turtle sanctuaries dotted along Sri Lanka’s coasts that focus on conservation of these endangered species. 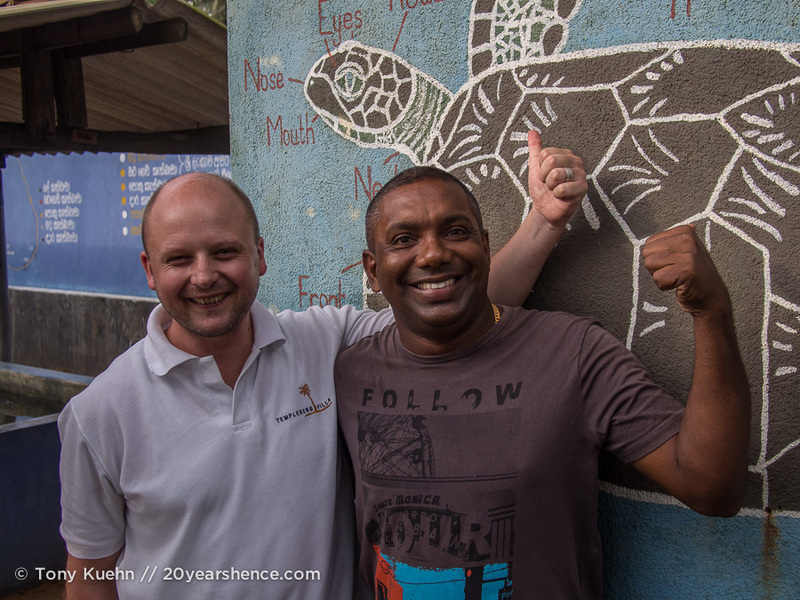 The one we visited near Mirissa is owned and operated by locals and focuses on both conservation (purchasing turtle eggs from locals who otherwise sell them for food) and rehabilitation (housing injured turtles and giving them a safe place to rest and recover). 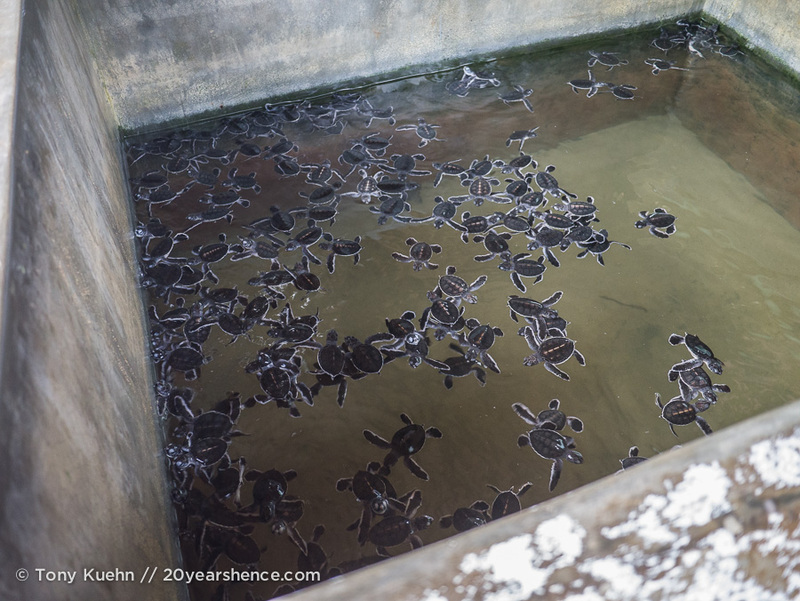 The ultimate goal is to release the animals into the wild (and in the case of newly hatched turtles, they are released at night on the same day they are hatched… the adorable babies pictured in the post were newborns who would be released that evening), but with some of the more injured turtles, they have a permanent home at the sanctuary. I know some of the sanctuaries in SL are rather dodgy allowing harmful interactions between visitors and the turtles, but this place seemed pretty top notch—you weren’t allowed to touch or handle the turtles in anyway, as much as we might have been tempted to (the turtles were so cute!). I should also mention that this turtle sanctuary we visited isn’t financially affiliated in any way with Templeberg; it’s just one of the local causes that Brent & his team have chosen to support. Our meal we made with Trixie was 100% vegetarian, but there was some ingredient that I’m now blanking on in some of the dishes that meant they were NOT vegan. 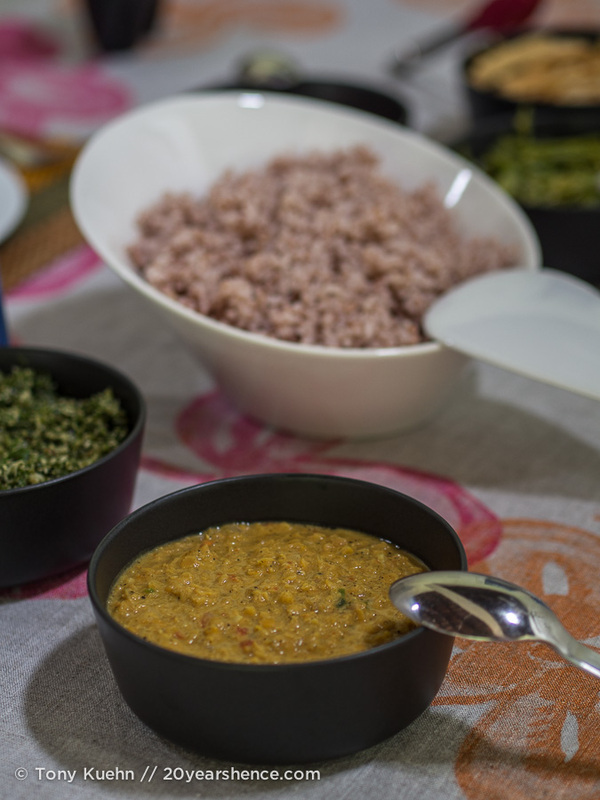 Whether it was a bit of butter or maybe the mustard cream (it’s such a Sri Lankan ingredient, I can’t verify exactly what went into it), I definitely noted that our feast was “almost vegan”. That said, you could very easily omit the non-vegan component if that were a concern, I’m fairly certain! Glad to hear this particular turtle sanctuary does the right thing regarding visitor/turtle interaction. If we are ever in the region we’ll try to go to this one and keep Templeberg Villa in mind. Wow wow wow, this looks amazing! I don’t suppose you have any recipes that you could share with us? Looks like such a wonderful experience, we would love this. I did write down some of the recipes for these dishes, so I will have to dig out my notebook and see what I can do! I’d definitely like to try to recreate some of these dishes at home; if they work out, I’ll happily post some recipes that I’m confident home cooks will be able to make themselves.